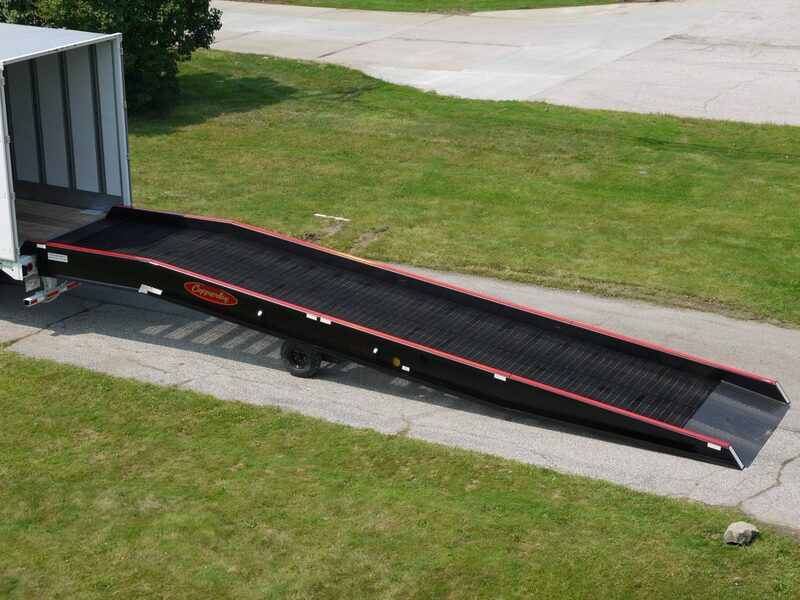 For loading docks to reach maximum efficiency, they need yard ramps that provide unparalleled strength and safety. Copperloy specializes in the design and manufacturing of loading dock ramps that drastically increase safety and productivity. The one-cylinder design of their portable loading ramp applies much less pressure than two-cylinder ramps. Copperloy hydraulic yard ramps provide enhanced stability, faster raising speed, and easier operation. They design their ramps with the hydraulic pump on the outside of the ramp, allowing for much easier access. Copperloy yard ramps also experience much less damage and wear relative to other competing products, greatly extending their lifespan. The Copperloy portable loading ramp design is a leader of strength and safety in the industry. Each yard ramp also has a variety of features and advantages to bring significant improvements to any loading dock operation. 8-Foot Level Off: This is one of the many renowned Copperloy ramp features. This 8-foot level off gives much easier access for forklifts onto loading docks, platforms, and trucks. This is an especially useful feature for portable loading ramps. Hydraulic Pump: Copperloy design makes any loading dock operation a much safer, efficient process. The location of the hydraulic hand pump, however, is a stand-out feature. The single-acting hand pump needs significantly less effort to operate relative to other industry products. Its location protects it from unnecessary dirt and damage, saving time on maintenance. Low End Plate and Safety Curb: Forklift access can be a tiring process with many other industry yard ramps. Copperloy, however, provides ramps with an end plate that is much shorter than a forklift’s wheelbase. The forklift’s from wheels can easily access the grating while maintain rear-wheel contact with the ground. There is also a seven-inch curb that prevents any runoff, allowing the forklift to travel smoothly and safely without encountering any bumps along the way. Solid/Pneumatic Tires: These solid tires remove the requirement of constant maintenance. With their lubricated bearings, Copperloy’s pneumatic tired are extremely trustworthy and maintenance-free. These are only a few of the many features and advantages you get with Copperloy hydraulic ramps. Companies looking to make a safer, smoother loading dock and increase productivity should consider Copperloy yard ramps.